$1,400,000 Located on East Atlantic Drive off East Sunrise. This commercial building mainly holds a large gym with an aerobics/dance room. It also has an exercise room for boxing and cycling. In addition a day spa and office area. This large building also houses a preschool and church. It previously housed a beauty salon and a restaurant. This property sits on 1 acre of land! and has excellent parking in the front and rear of the building. It is fenced in from the sides around the back. The building location is in an area of very high visibility minutes away from schools, medical clinics, petrol service station and a mini shopping mall. The front of the building was built in 1999 and the rear adjourning building was built in 2010. The entire building largely consists of 11,694 square feet. Property and equipment appraised at $1.5 M in 2010. This building has the ability to be transformed because of its size and layout into any type of business, church, school etc. Excellent location and great investment to rent out spaces. $1,400,000 Lighthouse Point is situated on the northeastern most tip of Clarence Town, Long Island and it is directly North of the Flying Fish Marina. The subject property is zoned commercially, is 20,473 sq ft and has 364 sq ft of linear beach frontage. The property is open on all sides and the grounds are landscaped with grass, palm trees, and flowering plants. The two story building itself is 3,200 interior sq ft with an unfinished attic space comprising of 1,200 sq ft. There are 8 efficiency apartments, 4 on the ground floor and 4 on the upper floor. Each apartment has an open bedroom/living area, kitchenette, and bathroom. Additionally there is 1,500 sq ft of porches, 750 sq ft of which is covered. Water is supplied by a 1,700 gallon rain water cistern. Long Island is situated 150 nautical miles south-east of New Providence and comprises of 173 square miles. There is one main road through the island from Seymour's in the North to Gordon's in the South. Electricity and telephone services have been extended to all parts of the island. $1,300,000 This is an open zoned 5 acre track of undeveloped land.The transformer is nearby and the plot is ready for development.This property is adjacent to a 4.91 acre track thay can aldo be purchased to expand the posdibilities and is near an upscale residential area and off the Eastern road. $1,275,000 The Western Business Centre is a newly constructed complex comprising 5 two-story buildings ranging from 1,200 sq. ft. to 4,800 sq. ft. This gated secure complex is lushly landscaped and well maintained. The professional office complex is conveniently situated between Lyford Cay and Albany and is attractively priced. The building is currently leased by a reliable long-tern tenant under a 3 year contract which was renewed in August, 2018. Do not miss this great investment opportunity! $1,200,000 The Western Business Centre is a newly constructed complex comprising 5 two-story buildings ranging from 1,200 sq. ft. to 4,800 sq. ft. This gated secure complex is lushly landscaped and well maintained. The professional office complex is conveniently situated between Lyford Cay and Albany and is attractively priced at $36.50 per sq. ft. per annum inclusive of CAM. The interior of this unit is a blank canvas and can be fitted out to your specifications. This modern high-efficiency building includes zoned central air-conditioning for each floor, Icynene foam insulation in the ceilings and plumbing infrastructure for two bathrooms. Inquire today! $1,160,000 An amazing beachfront acreage in beautiful Roses, Long Island nestled at "Little Harbour." A beauty like none other on miles of untouched white powdery sand with shallow, crystal clear turquoise-green-aqua-blue waters. Naturally crafted and partially elevated into a protected harbour that unravels into an open aquarium of baby turtles and conch. Feel the natural ambience of this 39.96 acre parcel that can be experienced on a rare gem away from it all. This piece of serene paradise has open and endless potential like, a honeymoon resort, marina, boutique hotel, excellent cruise ships dock haven, yacht clubhouse, beachfront vacation homes/villas or a combination of developments, just to name a few! Come snorkel, fish, dive, swim, surf, sail, kayak, beach comb or whatever your heart desires in complete privacy and safety. 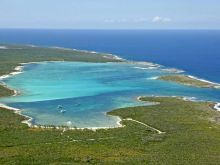 Home of the world's deepest blue hole, Dean's Blue Hole, where many travel across the planet just to take a glimpse or explore underwater beauty that only the tropics can offer. Secure your dream investment and take advantage of true island living at its best today!!! $1,100,000 Great investment opportunity for subdivision development. The property comprises 5.819 acres and located on the property is 4 bed 4 bath 5000 sq. ft. home, as well as a fourplex apartment complex. $1,050,000 Unique land parcel situated in the hub of western commercial activity in the fast growing Windsor Business Park on Windsor Field Road in Western Nassau. The lot is 36,244 square feet and is situated in a professional area surrounded by top class owners and renters. This parcel comes stubbed with all underground utilities and newly paved roads. The area is gated with security and protected by a strong property owners association which manages the area. $990,000 Huge Commercial Warehouse in Oakes Field area for sale. Centrally located to the ports, customs, Nassau city and shipping hubs. 1.2 Acres of commercial land. Fully enclosed perimeter fencing, storm shutters, utilities installed, ready to occupy in this safe and well-known area of Nassau. Easy access to highways and all parts of Nassau. Make an Offer! $990,000 Commercial Warehouse in Oakes Field area for sale. Centrally located to the ports, customs, Nassau city and shipping hubs. Fully enclosed perimeter fencing, storm shutters, utilities installed, ready to occupy in this safe and well-known area of Nassau. Easy access to highways and all parts of Nassau. Adjacent 1/2 acre property may be available for parking or expansion. Make an Offer!